Back at it with another Summer Tour announcement. Seems like they are dropping weekly now and I have no doubt we will see more. This one features Sublime with Rome and joining them will be SOJA, Michael Franti & Spearhead and The Common Kings. Certain bands will only be on select dates. For a full list of dates see below. 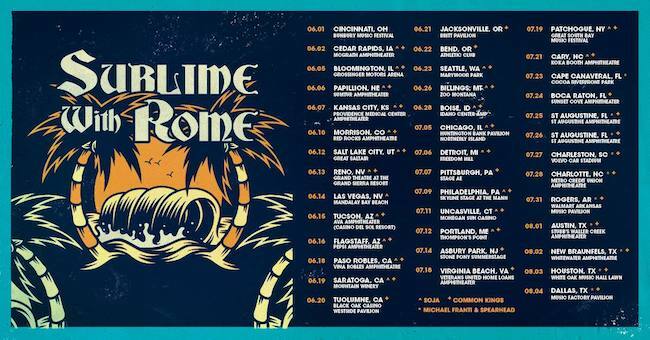 Sublime with Rome recently released a new single titled "Spiderweb". Michael Franti & The Spearhead has come out with new music as well with their release of "Stay Human Vol. 2". Hirie, Victoria Canal and AGodess are featured on the album. Common Kings "One Day" was released late last year and has many excellent artists that appear on the album. You can hear Stephen Marley, Matisyahu and others lend their amazing talents on "One Day" and you can check that album out below along with the others.